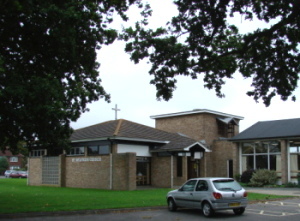 Opened in 1959 in the former parish hall of St Bartholomew as a mission church of St Paul’s, it became a conventional district in 1969 and then a parish. The present hall and church were adapted from the existing building in 1973 and, designed by Wells-Thorpe and Partners (ICBS), are built of buff brick. The church is a low square brick building with an altar-recess lit only from the sides and a glazed west wall. At the apex of the low-pitched roof is a cross and on the top of the adjacent low square tower is a small spike.